On Friday the 21st of April the verdict of the HPCSA enquiry into Prof Noakes will be announced. 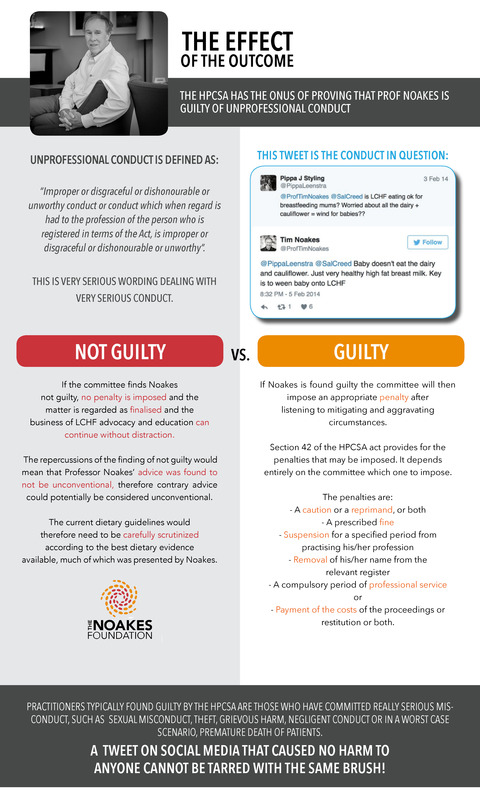 The HPCSA charged Prof Noakes with unprofessional conduct for giving unconventional advice over social media (Twitter) – the onus of proving that the advice was unconventional is on the HPCSA. Prof Noakes and his expert witnesses delivered an overwhelming amount of scientific evidence in support of the Low Carb High Fat lifestyle, making a compelling case. In comparison, the complainants were not able to produce any evidence to support the conventional low-fat diet and did not present sound reasons to show that the tweet was unprofessional and unconventional.